Stella was initially so overcome by the avant-garde art he saw in Paris in 1911-1912 that he was unable to work. 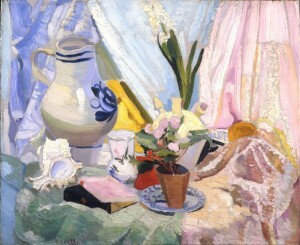 When he was ready to paint, he completed a series of Post-Impressionist still lifes—this canvas is a prime example. It illustrates the ways in which Stella experimented with high-keyed color and textured surfaces while retaining the illusion of three-dimensional space and the realistic depiction of objects. This work’s Fauvist palette and Cézanne-inspired composition reflect a major shift away from Stella’s early Old Master style, but not the full leap into modernism that would inspire his iconic Futurist views of the Brooklyn Bridge, Coney Island, and other New York locales. Barbara Haskell, Joseph Stella (New York: Whitney Museum of American Art, 1994), 34 , 191, n. 65. A different painting by Stella, Landscape, was sent to the exhibition’s Chicago venue.